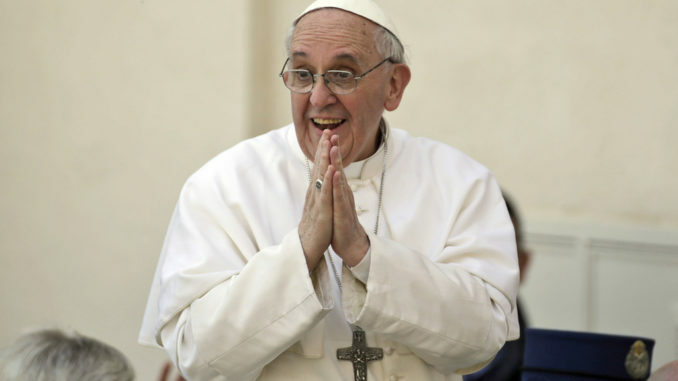 Pope Francis: "I Want To Visit Craggy Island"
Pope Francis has confused Irish government officials and Catholic Church leaders by insisting that he gets to visit Craggy Island during his visit to Ireland this weekend. It appears the 80 year-old Pontiff is a huge fan of iconic TV show Father Ted but is completely unaware that it’s fiction. During a press conference in the Vatican yesterday to reveal details of the trip, the Pope was asked if there’s anywhere in particular he’s looking forward to seeing during his visit to Ireland. Archbishop Diarmuid Martin said nobody in the Pope’s entourage has had the nerve yet to tell him that Craggy Island isn’t a real place. “It’s an awkward one. He won’t stop going on about Father Ted. I tried to change the subject and asked him if he was looking forward to seeing the place where Pope John Paul ll said mass in 1979 but he said he’d rather see the place where Ted kicked Bishop Brennan up the arse in episode 6. Pope Francis has already given his personal security a huge problem for the Irish trip by insisting that his bullet-proof Popemobile be left at home and telling them he wants to be driven around Ireland in Pat Mustard’s milk float instead.